Sophie and Chris Kennedy were tempted to elope from the moment he proposed at Lancaster High School in July 2017. The high school sweethearts—who met as freshman and started dating as juniors—didn’t want a long engagement, and the romantic notion of jetting away to say I do felt like the perfect plan. That is, until they started putting the idea through its paces. So they came up with a modified plan: A small, local wedding for close friends and family followed by an extended two-week honeymoon to Mexico. As events manager for Private Knives Catering, Sophie was already embedded in the wedding world—and her own day ended up capping off their 2018 wedding season. 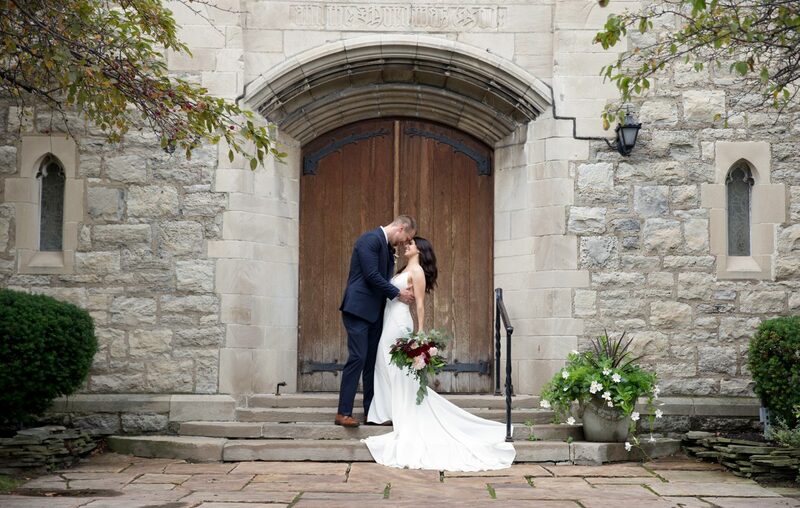 The striking stained glass windows and ornate wood ceiling of St. John’s-Grace at Colonial Circle in Buffalo set the backdrop for Sophie and Joe’s ceremony. The couple fell for the intimate scale of Brickhall in the Hollow. “I liked that everyone was together and cozy,” says Sophie. Plus the Clarence venue met a core requirement: that Private Knives could cater. From their signature cocktails and Italian-inspired menu to the flowers and decor (including hand-died cheesecloth runners), owner Amy Phillips and her team made sure it was a magical, stress-free day for one of their own.